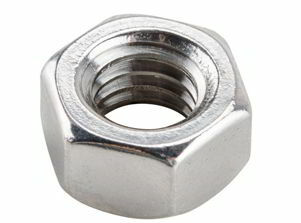 Nickel Alloy UNS N08825 Industrial Hex Nuts Stockists, Nickelvac® 825 Flange Nuts Suppliers, DIN 2.4858 Eye Nuts, Nicrofer® 4221 Nuts, Distributors of ASME SB564 Incoloy 825 High Nuts, Incoloy 825 Square Nuts, Incoloy 825 Fasteners, ASTM B425 Incoloy 825® Nuts, ASTM B564 Incoloy 825 Nuts, Alloy 825 2-H Heavy Hex Nut Dealer in Mumbai, India. Incoloy 825 Machine Hex Nut, DIN 934 Nickel Alloy 825 Nylon Insert Lock Nuts, Incoloy Gr. 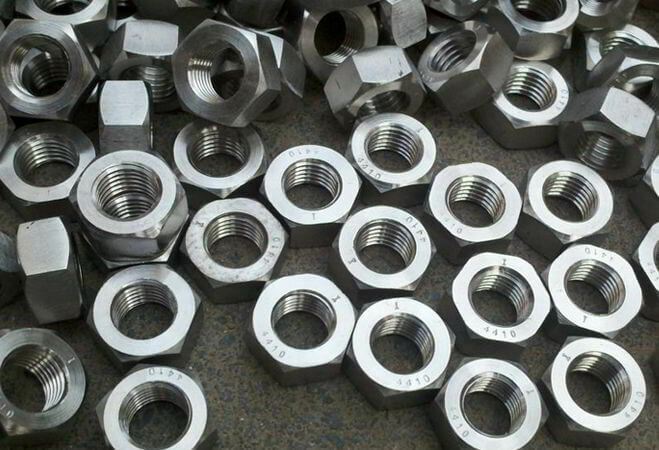 825 Custom Nuts Manufacturer, SB564 Alloy 825 Nuts Wholesaler, ANSI B18.2.2 Incoloy 825 2-Way Lock Nuts, ASME SB425 Incoloy UNS N08825 Jam Nuts Exporters. 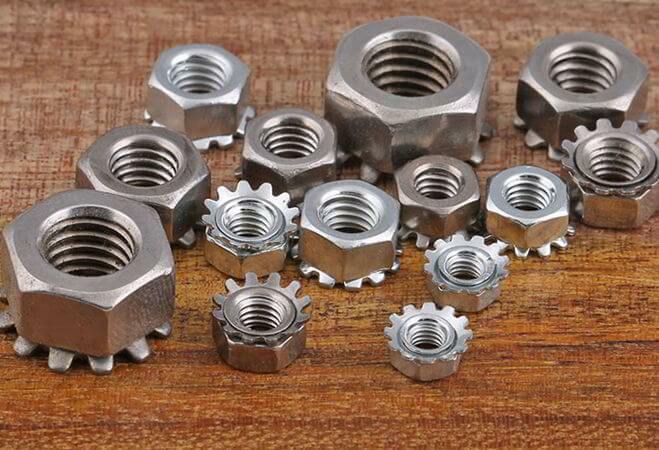 Renine Metalloys is a prominent supplier of Incoloy 825 Nuts, which is similar to alloy 800 but with improved resistance to aqueous corrosion. 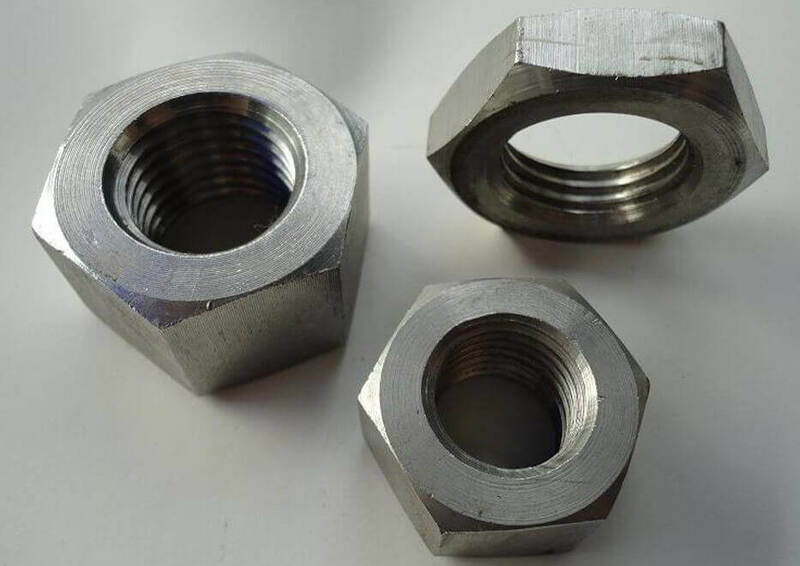 Incoloy 825 Hex Head Nuts is a nickel-iron-chromium-molybdenum alloy with good corrosion resistance to sulfuric and phosphoric acids and sea water. 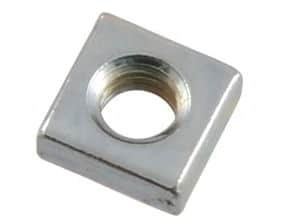 Any discoloration / heat tint in Incoloy 825 Square Nuts should be removed preferably by brushing with a stainless steel wire brush while the weld metal is still hot. 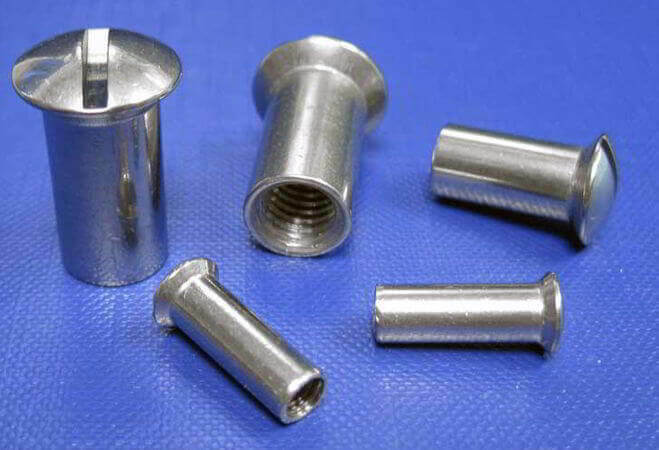 Because it is stabilized against sensitization, Incoloy 825 Lock Nuts resists inter-granular corrosion. 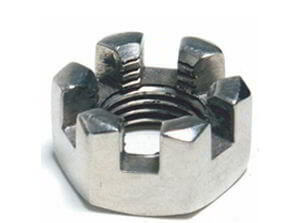 The forging temperature range for Incoloy 825 Eye Nuts is 2150 Degree F / 1600 Degree F (1180 Degree / 870 Degree C). 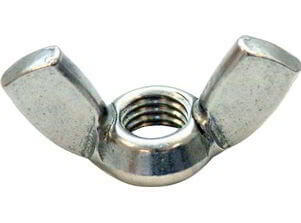 Incoloy 825 Wing Nuts resists general corrosion, pitting, crevice corrosion, inter - granular corrosion, and stress-corrosion cracking in both reducing and oxidizing environments. Incoloy 825 T-Nuts is particularly useful in sulphuric & phosphoric acids, sulphur containing flue gases, sour gas and oil wells and sea water. 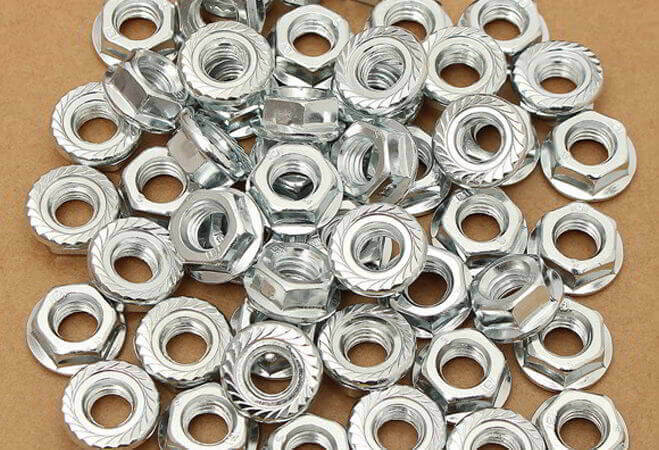 Incoloy 825 Panel Nuts is excellent resistance to both reducing and oxidizing acids like sulfuric and phosphoric. In both oxidizing and reducing environments, Incoloy 825 Coupling Nuts resists general corrosion, pitting, crevice corrosion, inter-granular corrosion and chloride stress - corrosion cracking. If these Incoloy 825 Dome Nuts is to be welded or subjected to further thermal treatment and subsequently exposed to an environment that may cause inter - granular corrosion, the stabilizing anneal should be performed regardless of cooling rate from the hot - working temperature. Nicrofer® 4221 Heavy Hexagonal Nuts, UNS N08825 Nickel Alloy Wing Nuts, Incoloy 825 Weld Nut, Alloy 825 Cap Nuts, ISO 4032 Incoloy 825 Long Nuts Exporters, Nickelvac® 825 Slotted Nuts Suppliers, Werkstoff No 2.4858 Nuts, Incoloy 825 Sleeve Nut Traders. 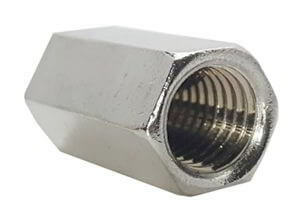 Incoloy 825 Nuts, Nickelvac® 825 Heavy Nut, Nicrofer® 4221 Hex Nuts, ASTM B564 Incoloy 825 Nuts, Incoloy 825 Fasteners Exporters, ASME SB425 Incoloy 825 K Lock Nuts, ASME SB564 Alloy 825 Custom Nuts, Incoloy 825 T- Tee Nuts, UNS N08825 Incoloy Dome Nut, Incoloy 825 Flange Nut, Nickel Alloy 825 Lock Nuts, 825 Alloy Industrial Nuts, Nickelvac® 825 Weld Nuts, DIN 2.4858 Incoloy Cage Nuts, ASTM B564 Incoloy 825 Allenuts, ASTM B425 Incoloy 825 Cage Nuts, ASTM B564 / ASME SB564 825 Incoloy Spring Nuts, Werkstoff No 2.4858 Incoloy High Nuts, Incoloy 825 ACME Nuts, Incoloy 825 Cap Nuts, Nicrofer® 4221 Coil Nuts, ASME SB564 Incoloy 825 Handle Nuts Exporter, ASME SB425 825 Incoloy Hurricane Nuts, Nickel Alloy UNS N08825 Heavy Hex Nuts Supplier, Nickelvac® 825 Square Nuts, ASTM B564 Incoloy 825® Jam Nuts, Incoloy Alloy 825 Slotted Hex Nuts, Nickel Alloy 825 Kep Nuts, Alloy 825 Sleeve Nuts Stockist, Incoloy 825 Flex Lock Nuts, Incoloy Alloy 825 Pin Lock Nut, Incoloy 825 Flex Lock Nuts, 825 Incoloy Slotted Nut, B564 Nickelvac® 825 High Nuts, Nicrofer® 4221 Cap Nuts, Alloy 825 Castle Nuts Stockists, Incoloy Alloy 825 Hex Nuts Stockists, ASTM B564M Nickel Alloy UNS N08825 Auto Lock Nuts, Incoloy 825 2-H Heavy Hex Nuts Traders, Nickel Alloy 825 Miscellaneous Nuts Dealer, Incoloy 825 Nylon Insert Lock Nuts, ASME SB425 / SB564 Incoloy Grade 825 Serrated Flange Nuts, Incoloy 825 Hexagonal Nuts, Incoloy 825 Flange Nuts Stockholder, Incoloy 825 2-Way Lock Nuts, Supplier of High Quality Incoloy 825 Coupling Nuts, Manufacturer of Incoloy 825 Acorn Nuts Traders, Exporters of Incoloy 825 Slotted Nuts, Incoloy 825 Machine Hex Nuts Dealer, Incoloy Alloy 825 Panel Nuts Stockholders, 825 Incoloy Alloy Thin Nuts Wholesaler in India, Incoloy 825 Eye Nut Manufacturer, Distributors of Incoloy 825® Rivet Nuts Stockholders, DIN 934 Standard Incoloy 825 Nuts, B18.2.2 ANSI Standard Incoloy 825 Nut, (BS1768, BS 1769) BS Standard Incoloy Alloy 825 Nuts, ISO 4032 Standard Incoloy 825 Nuts.